Prajavani Online Ad Booking website has made easy to book Classified Ad for Newspaper. 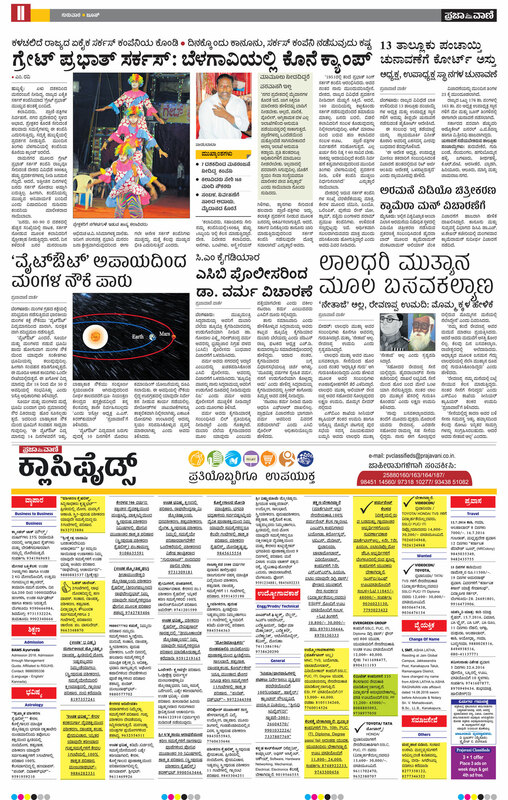 Now its very simple to book Advertisement in Prajavani Newspaper. Prajavani Advertisement rates are different of every category and city. To know Prajavani Ad Rates you first need to select the category or city of Prajavani. Then you can view the ad rates for classifieds. There are different promotional offers available in Prajavani Classifieds which would save cost for advertising in Multiple cities. Select from the available categories in Prajavani Classifieds to view ad rates. 1. Matrimonial Ad 2. Recruitment Ad 3. Property for Sale Classified 4. Property Rental Classifieds 5. Name Change Advertisement 6. Lost Found Ad 7. Vehicles for Sale Ad 8. Astrology Advertisement 9. Business Classified Ad 10. Computers Ad 11. Classified Remembrance Advertisement 12. Education Ad 13. Obituary Advertisement 14. Personal Announcement Classified 15. Personal Messages Ad 16. Retail Ads 17. Services Classifieds 18. Travel Advertisement. After selecting the category you can view ad rates of all available Packages for every city of Prajavani. Its easy to book your advertisement online in Prajavani Classified Page. Once you select the category choose the package from the available options and select the date of publishing your ad from the calendar and compose your ad. After you compose your ad you just need to make payment. There are various payment options available to book ad in Prajavani.